One 200ml can will provide all-over protection for 6-8 days so this pack will protect a family of 4 for a week or two adults for 2 weeks. Fragrance-free and breathable, Techniblock will not block pores or irritate even the most sensitive skin, significantly reducing or even eradicating the symptoms of skin rash and prickly heat. It contains anti-oxidants to enhance the skin's natural defences in the fight against the damaging effects of UV exposure. It's comfortable and clean to wear, doesn't need rubbing in non-sticky on the skin so sand won't stick! Techniblock has an extended shelf life because it is packaged in a sealed and pressurised airtight container, meaning no waste and no risk of spillage in the bottom of your beach bag! 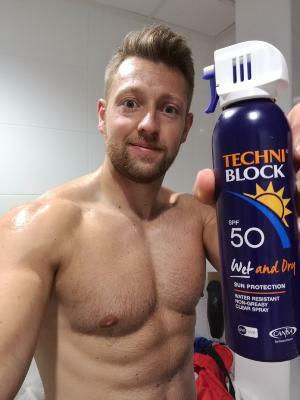 Developed and manufactured to the highest standards by Technikon Pharmaceutical Laboratories in South Africa, Techniblock provides 5* broad spectrum (UVA and UVB) protection and is fully compliant with European regulations for sunscreens.